Under the influence of (inter)national technological, political and economic developments, the Dutch defence industry is increasingly intertwined with and developing towards a civilian industry. Consequently, the political responsibilities, atti-tudes and criteria are changing for both the Ministry of Defence and the Ministry of Economic Affairs. An analysis of the Dutch defence industry helped to determine the main opportunities for innovation in the industry and to identify the com-plementary technological competences needed to make the most of them. A strategic vision, including options for innova-tion policy, was developed as well. In this follow-up brief, we reiterate the background, approach and results of the initial foresight study and describe its impact in the years to follow. Historically, “defence” supports national strategy, in which nations have built their own forces, defence industry and knowledge infrastructure. Consequently, within nations there arose a demand driven chain with a solid and confidential relationship between the parties in a closed chain, also discerning the industry from ‘civil’ industries. However, technological, political and economic developments in the last twenty years are changing defence radically. Issues such as the end of the Cold War, decreasing budgets, international cooperation, international organization of forces, industries and knowledge infrastructure, growing use of civil technologies, civil industries and civil markets, ‘the war on terrorism’, and homeland defence have entered the stage. Consequently, the political responsibilities, attitudes and measurements are changing for both the Ministry of Defence and the Ministry of Economic Affairs, while the defence industry and knowledge infrastructure is increasingly intertwined and developing towards a civil industry and knowledge infrastructure. This critical transition of the defence chain demands timely strategic information and a vision to anticipate effectively. For ministries this means a clear view on responsibilities, effective investment strategies for a capable future force and an effective industry and innovation policy. The defence industry increasingly has to deter-mine their most favourable innovative possibilities. – policy instruments to strengthen the strategic vision. What are the current strengths of the Dutch defence industry? What are international opportunities for innovation in the defence market? The challenge of the exercise was to systematically translate the four sub questions into perspectives on technological clusters or innovation opportunities. This makes the outcomes comparable. Every perspective was analysed and then translated into a codified taxonomy of technologies developed by the Western European Armaments Group (WEAG); this WEAG-classification on defence technologies is generally accepted within the defence sector. This taxonomy includes technology, products and intelligence or as they are called ‘underpinning technologies’, ‘systems-related technologies’ and ‘military assessments, equipment and functions’. Additionally, the WEAG-classes were checked for interrelation such that priority clusters are formed and interpreted, which seem to combine specific technologies with products and intelligence. Finally, these priority clusters are compared such that a final reflection is made from the four different perspectives (see figure 1). For determining the strengths of the defence industry, companies were analysed and a computer aided workshop including the industry was organized (Group Decision Room). The innovative opportunities were inventoried based on desk re-search and interviews with leading parties. Future needs of the military forces were inventoried and weighted based on al-ready planned investments by the Ministry of Defence. Finally, the civil market was assessed by experts based on most relevant societal challenges. Below the analysis on current strengths is elaborated. For foresight purposes, the results on innovative opportunities are also included. Military operations are increasingly operations other than war, such as peace operations, foreign humanitarian assistance and other military support to civil authorities. Consequently, governments turned their focus on the ultimate goal of ‘effect-based [security] operations’. In practice, effect-based operations imply a joint and combined cooperation between different armies and forces resulting in a transformation of a plat-form-centric force into a network-centric force. The term “network-centric warfare” or “network enabled operations” broadly describes the combination of emerging tactics, techniques, and procedures that a fully or even partially networked force can employ to create a decisive advantage. On the whole, the defence sector still innovates on platforms, weaponry and increasingly on intelligence. 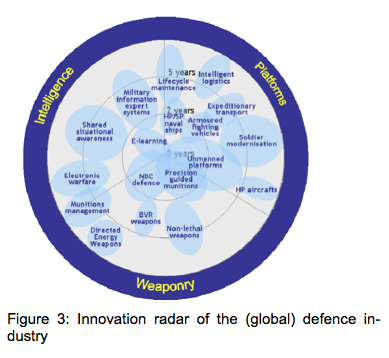 Figure 3 below shows all innovation themes which are on the agenda of the defence sector. Innovation themes are divided into underlying innovative opportunities, translated in the WEAG-classification and finally clusters are identified. The main clusters are C4I, sensor systems and integrated system design and development. The clusters arising from the four perspectives are compared with each other to identify the main clusters. Table 3 below shows the synthesis. 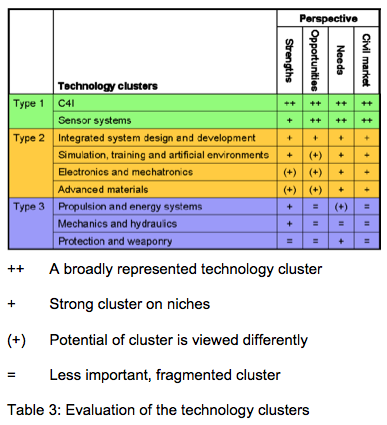 Type 1 clusters can be regarded as broad, strong clusters, with a good industry base and market potential in domestic, inter-national and civil markets. This first type of cluster represents information based services for the Dutch industry. Type 2 clusters cover a couple of interesting niche markets. Finally, type 3 clusters are fragmented but might have some niches. The project was on a highly political trajectory, where the interests of industry and the ministries of Defence and Economic Affairs were intertwined. Also being a part of a broader process and the project delivering the content for just one of four working groups led to intensive discussions within the interdepartmental group before the results could be used as input to the national strategy for the defence industry. This, together with the change of government, considerably prolonged the finalization of the strategy. About one year after the finalization of the project, the ministries determined their Defence industry strategy. The results of the project were largely integrated into the strategy and therefore had a high impact. The technological priorities stated were fully accepted and provided the backbone to the suggested defence innovation policy. The strategy was discussed in Parliament and will be part of the national policy on the defence industry. As noted, the results from the 2006 foresight exercise were integrated in the Dutch Defense Industry Strategy of 2007. However, since 2007 the strategic context in which this industry sector operates has changed significantly. New forms of conflict arise, that demand new kinds of response (e.g. cyberdefense), closer cooperation with coalition partners requires further integration of systems, the financial crisis has had an impact on defense budgets, and finally there is a clear movement to an open and transparent European defense market. These strategic changes has prompted the Dutch Defense Ministry to evaluate the Defense Industry Strategy that was formulated in 2007. A key part of this evaluation is a follow-up foresight exercise to the foresight exercise of 2006 described earlier in this brief. In the original foresight exercise, research was done on three questions with regards to the Dutch Defense Industry: (1) what is the Dutch Defense Industry good in? (2) What does the market need? (3) What does Dutch Defense need? Questions 1 and 2 were sufficiently answered, but changes in the strategic context require an update to these answers. The answer to 3 was less detailed, and still required a more extensive study. This follow-up foresight exercise is planned for 2012, and will be performed by the Hague Centre for Strategic Studies and TNO. It aims to examine whether the identified technology clusters are still relevant, whether they need to be adjusted to extended, considering the developments in the last 5 years. The approach is mostly similar to the one of the previous foresight exercise. Several other forward looking activities in the past 5 years provide key input for the follow-up foresight study, including an exploration to the Dutch Defense force of the future (Dutch Ministry of Defense, 2010), and a NATO study into the future of joint operations (NATO, 2011). Needs: the future needs of the Dutch defense are investigated, including innovation characteristics of (new) required capacities, attention to the speeding-up of the lifecycle of innovations and capacities, and the role of defense in this lifecycle of capacities and innovations. Strengths: the strengths of the Dutch defense industry are analyzed using datasets gathered yearly by other organizations using interviews and surveys with industry organizations. Opportunities: in interviews and focus group sessions the estimates that the Dutch defense industry make about their own future opportunities are analyzed. This analysis is accompanied by an international comparison and a separate analysis by the organizations performing the follow-up foresight exercise. In a synthesis phase, representatives from ministries, industry and knowledge institutions will be brought together in a workshop session, in which the final conclusions and recommendations of the study will be formulated. The foresight exercise described in the original brief had a high level of impact in a specific area: the Dutch Defense Industry Strategy. The study results have proven to be useful in formulating a defense industry strategy by the relevant ministries. This usefulness is further illustrated by the fact that a follow-up study was requested and has been initiated, which is expected to provide input for an update to the defense industry strategy. Download EFP Brief No. 236_Assessing Dutch Defence Needs_Follow-up. Butter, M, J.H.A. Hoogendoorn, A. Rensma and A. van der Giessen (2006), “The Dutch Defence Outlook”, TNO.